Snooper satellite navigation systems include the AURA speed camera locations database. This is the most comprehensive database of speed camera locations including the countries UK and Ireland, USA, Canada, Australia and New Zealand. The Snooper sat navs also include a My Speed database of speed limits, so that no matter what road you are driving on, regardless of whether there is a speed camera present or not, you always know the speed limit of the road. You will receive street-level directions to your destination using Navteq mapping. LCD screen sizes range from 4.3-inch on the entry-level Snooper S2500, a 5-inch screen on the SC5800 DVR with built-in DVR camera and an impressive 7-inch on the S6800, S8000 and DB8500 models. Along with sat nav and speed camera capabilities some models also feature a DAB Digital Radio and DVB-T Digital TV as well as Bluetooth handsfree functionality too. Currently all Snooper navigators include FREE Lifetime map updates and Lane Guidance and Junction View to help you at motorway junctions. There are two versions of each sat nav available with either UK and Ireland or full European mapping, with the exception of Ventura which is preloaded with Europe maps only. Although each model is designated the same model number eg. DB8500 there are three different variations of the DB8500 including Syrius (car version), Truckmate (truck version) and Ventura (caravan version). The latest models of which are the Pro versions. To read more about each model variation see below. Snooper Syrius systems will help route you along your journey whilst driving a car or a small van. You can also upgrade them to include the AURA speed camera locations database. The Truckmate is designed for coaches, large vans and trucks and features a knowledge of height, weight and width restrictions so that you are only routed along roads that are suitable given your vehicles dimensions which you input into the device. Designed with caravanners and motorhomers Ventura models features a knowledge of height, weight and width restrictions so that given your vehicles dimensions you only get routed along appropriate roads. The Ventura systems also include a database of camping sites from The Caravan Club, The Camping and Caravanning Club, ASCI, Bordatlas and Camperstop. To read more click here. All of the sat navs are reviewed here. 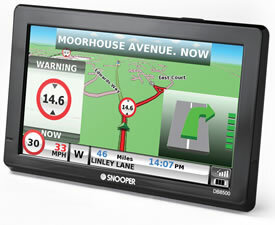 All of the Snooper sat navs reviewed on SpeedCamerasUK.com are also available to buy from us and include FREE delivery. For UK orders, we aim to dispatch same working day for orders placed before 1pm on any working day. Delivery can be expected 1 to 7 days after placing your order. 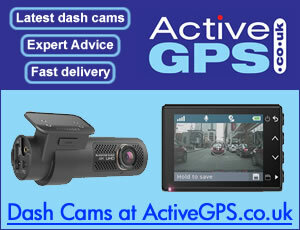 To view the latest range of sat navs to buy click here.